After our ride, Zelda’s eye was soft and kind. Before our ride? An edge of mischief. 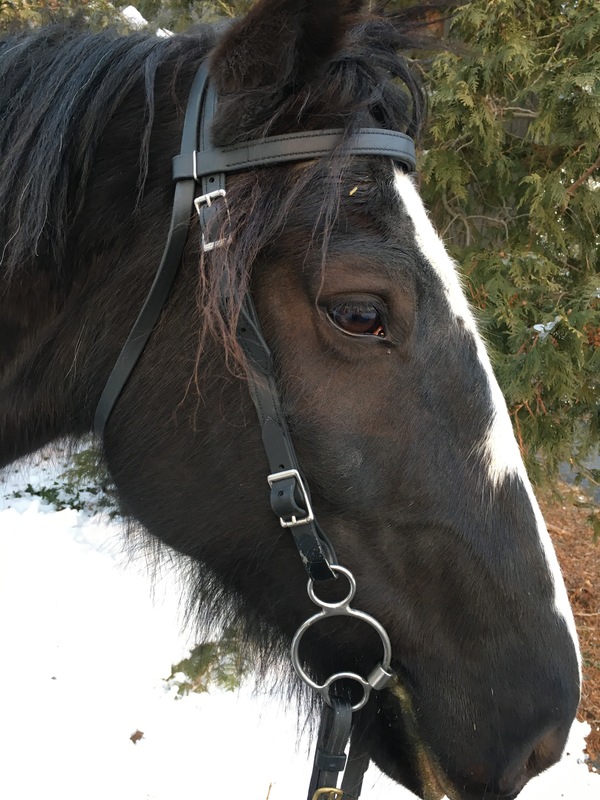 Much of the time in the winter I ride Zelda in a bitless bridle. It seems cruel to put a cold piece of metal in her mouth. Today? I could tell that she had some mischief in her. Something about the look in her eye. So I chose a bit that gives me a bit more control: a universal 2 1/2 ring. There are a couple of things I like about this bit. First, you can see that it gives a small amount of leverage that puts some pressure on her poll. Not a lot, just a reminder. Second, it’s adjustable. On days when I’m sure she’ll be good, I attach the rein to the large ring and it works just like a baucher snaffle — with the stability of the fixed side piece and the slight movement of a loose ring. I’m a big fan of the universal set up because it lets you adjust your ride without having a bag full of bits. Because these bits are not cheap! 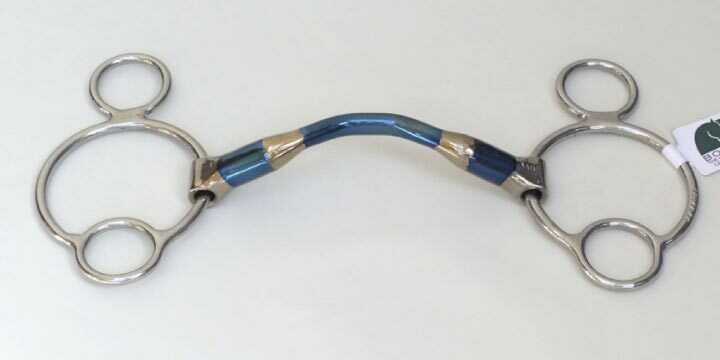 This one runs about $90 but is hard to find in the U.S. As I recall, I bought it from a tack shop in England that allows you to try the bit and return it if it doesn’t work for your horse. What Zelda likes about it is the ported mouthpiece which gives relief to horses that don’t like tongue pressure. This is a ported bit so gives some relief to horses that don’t like tongue pressure. The pretty blue color fades after you’ve used it, but horses like the sweet metal. I believe I bought this bit for my Trakehner, who had a thick tongue and a low palate. However, when I first started riding Zelda, I had a hard time getting her to accept a true contact. She was very vocal in her dislike of some of the bits I tried. Finally I tried some different mouthpieces. 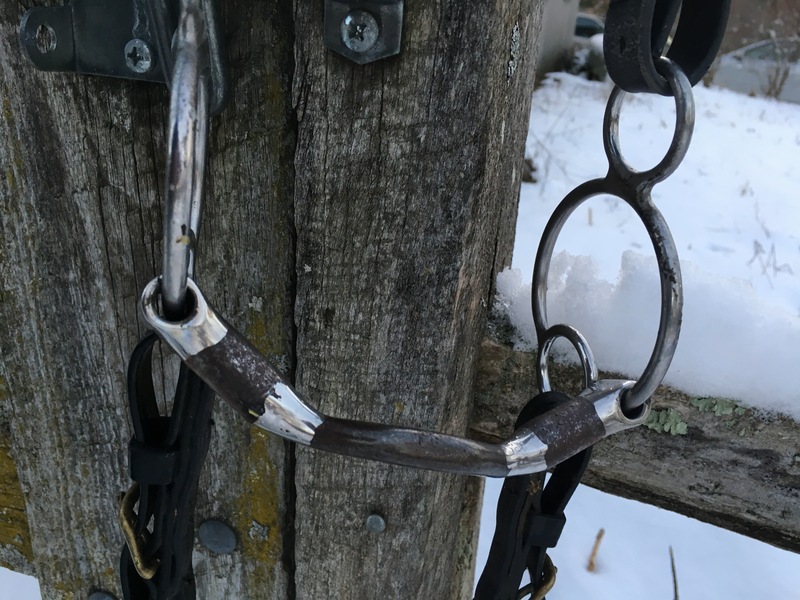 She likes this one, the Neue Shule Demi Anky (I’ll write about that one later) and the PeeWee bit, which is a thin, sweet metal mullen mouth bit. So, did I need the extra leverage today? You bet. The calm before the storm. 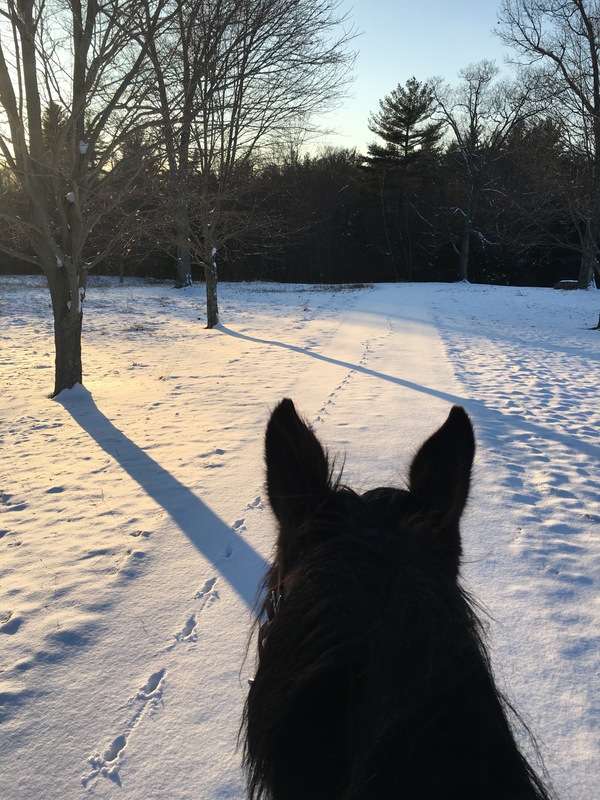 Moments after the tranquility of this photo, she got spooked by a deer, spun and bucked. 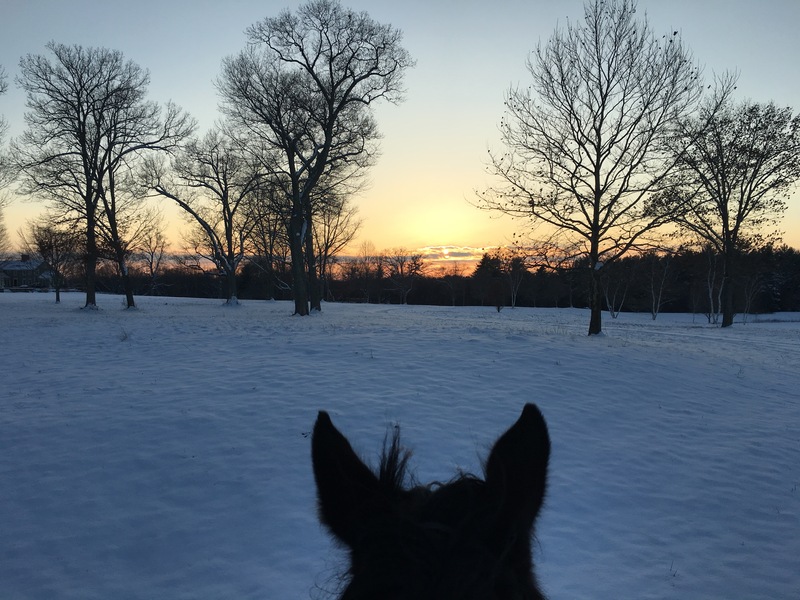 We worked through the spook, rode the buck and marched through the snow for an hour. By the time we got back, the sun was starting to set and the sillies were almost gone. The photo doesn’t do the sunset justice. It was spectacular.